Photo: Britain’s Prime Minister Theresa May leaves 10 Downing Street for the House of Commons for her weekly Prime Minister’s question time, in London, Wednesday, Jan. 9, 2019. 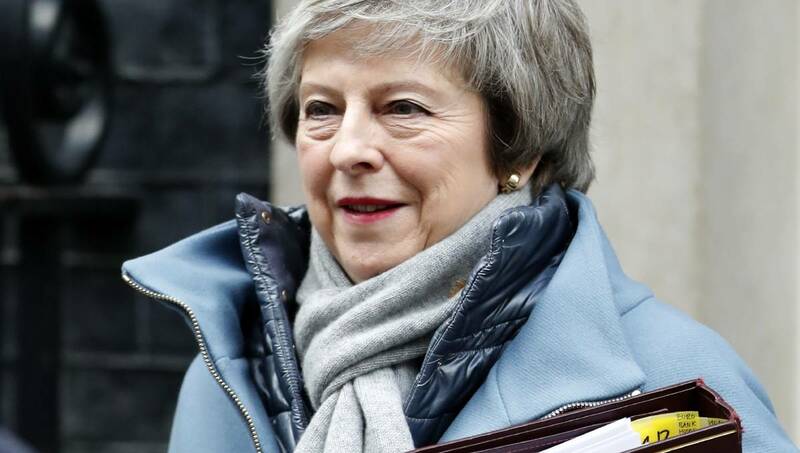 London, Jan 9 : Britain’s government and its lawmakers were set to clash Wednesday, as Prime Minister Theresa May brought her little-loved Brexit deal back to Parliament, a month after postponing a vote on the agreement to stave off near-certain defeat. The House of Commons was beginning five days of debate on an agreement with the European Union setting out the terms of Britain’s departure from the bloc on March 29. A vote, initially slated for mid-December, is now scheduled for Jan. 15 — and the government still looks likely to lose. May called off the December vote at the last minute when it became clear that a majority of lawmakers — from the governing Conservatives as well as opposition parties — opposed the deal, a compromise that has left both pro-European and pro-Brexit politicians unhappy. May promised to seek reassurances from the EU on the most contentious issue, the status of the Northern Ireland-Ireland border. But the bloc refuses to reopen the agreement, and opposition to the negotiated deal remains strong among British lawmakers. Amid the stalemate, pro-Brexit members of Parliament are urging the government to ramp up preparations for leaving the EU without a deal. But many lawmakers, and businesses, say that would cause economic turmoil, as goods moving between Britain and the EU suddenly faced customs checks, tariffs and other barriers. On Tuesday, legislators determined to prevent a “no-deal” Brexit handed the government a symbolic defeat by backing an amendment to the Finance Bill that puts roadblocks in the way of government spending on preparations for leaving the EU without a divorce agreement. The vote, which saw 20 legislators from May’s Conservative Party rebel and side with the opposition, indicates that a majority in Parliament opposes leaving the EU without an agreement and will try to stop it happening. But there is no clear majority for any single alternate course. Among the competing proposals are seeking a new deal, calling a general election or holding a second EU membership referendum. The Labour Party said it would try to trigger an election by calling for a no-confidence vote in the government if May’s deal is defeated next week. There’s no guarantee Labour could marshal the majority support in Parliament needed to topple the government — and even if it did, a new election would not automatically stop the Brexit countdown clock. “I don’t think that the British public are served by fantasies about magical alternative deals that are somehow going to sort of spring out of a cupboard in Brussels,” Lidington told the BBC.